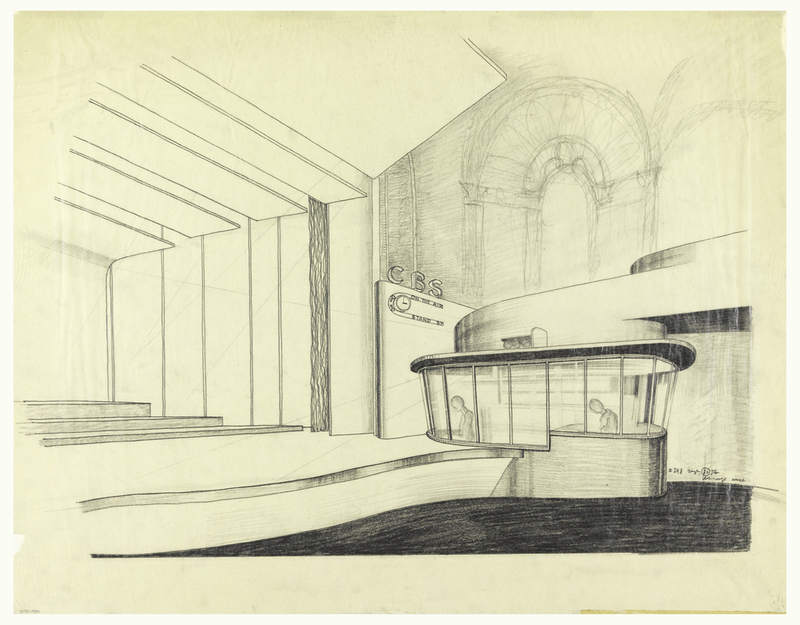 In 1937, Cooper Hewitt acquired blueprints and drawings made by Swiss-American architect William Lescaze. The drawing above shows Lescaze’s 1934 plan for the redesign of New York’s Avon Theater at 251 W 45th street. The original theater, designed by architect Eugene De Rosa, was known as the Klaw Theatre. The name changed to the Avon Theater in 1929 and later to the CBS Radio Playhouse in 1934 when CBS hired Lescaze to redesign the theater. The most striking change Lescaze made to Eugene De Rosa’s original design was the addition of a radio control booth to the proscenium arch at stage left. Some years later, architectural historian Lorraine Lanmon began studying the work of William Lescaze for her 1979 dissertation. Her 1987 biography of the architect noted that the new radio control booth blended with the proscenium arch and the balcony to give “the effect that considerably more remodeling had been done than was actually the case.” For the CBS project, Lescaze had to consider the way that sound moves. In the theatre’s former function, it was essential that sound travel toward the audience; however when Lescaze redesigned the theater for radio broadcasting, different acoustic requirements dictated the architecture. As Lanmon explains, “curved screens, designed to correct acoustical defects, were set at the edge of the stage” near the booth where the recording would be taken. The work Lescaze did for CBS represents a first in the history of design in more ways than one. In the 1930s, the notion of a broadcasting facility that included seating for a large studio audience was a new concept. Lescaze was at the forefront of designing this new type of cultural space. Furthermore, his work at CBS was also tied to the concept of a unified corporate identity. Doordan argues that Lescaze was fundamental in introducing the notion of a corporate designer “by demonstrating the advantages of treating design as an integral part of corporate planning.” Everything Lescaze created for CBS, from logos to clocks to the architecture of broadcasting studios like the Avon, supported CBS’s specific corporate identity and communicated the company’s mission.